Situated about 285 km from Mumbai, Mahabaleshwar is a wide plateau which spreads across an area of 150 km and is wrapped by valleys from all the sides. The highest peak in the place scales to a height of 1430 m which is known as Sunrise Point or Wilson. The hill station is the birth point of the river Krishna, which flows across the states of Maharashtra, Karnataka and Andhra Pradesh. As per legends, the source of the river is believed to be from the mouth of a Nandi statue at the ancient temple of Mahadev in Old Mahabaleshwar. By Air: The nearest airport is the Pune Airport which is located at a distance of 120 km from here. The airport is well connected to all the major cities across the country such as Delhi, Bengaluru, Chennai, Hyderabad etc. By Train: Satara is the nearest railway station, located around 55 km away from here and is connected to the major cities of Maharashtra. By Road: One of the best ways to reach Mahabaleshwar is by road. The town is well connected by roads and there are regular buses which operate from major cities to Mahabaleshwar. The total driving distance from Mumbai to Mahabaleshwar is around 263 km. 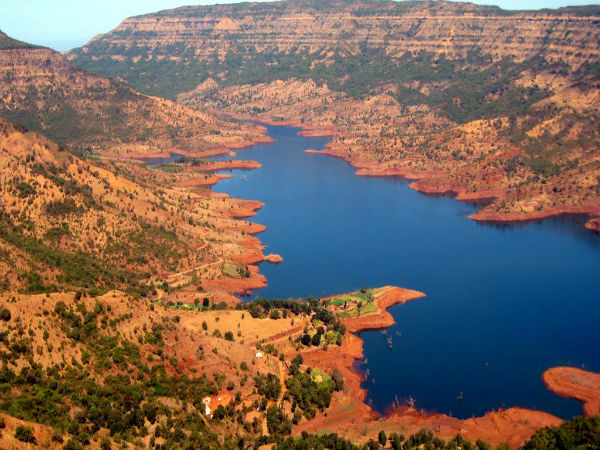 Best Time To Visit: Mahabaleshwar is a year around destination, however, the months from October to June are considered to be the best months to pay a visit to this hilly retreat. One can reach Mahabaleshwar from Mumbai by taking one of the routes mentioned below. Route 1: Mumbai - Rasayani - Lonavala - Pimpri - Chinchwad - Pune - Khandala - Wai - Mahabaleshwar via Mumbai - Pune highway and NH 48. If one opts to travel through route 1, you can reach Mahabaleshwar by driving down a distance of 263 km which would take around 5 h from Mumbai. By route 2, it would take you around 5.5 h to cover the total distance of 231 km via NH 66 and it should take you around 6 h to cover the total distance of 221 km via NH 66 and SH 72. Pimpri - Chinchwad is a suburb in Pune which is formed by the former independent localities of Chinchwad, Pimpri, Nigdi, Akurdi, Kalewadi and Bhosari. Chinchwad gets its name from Chinch or tamarind and Wad or banyan trees. The place is well known for the shrine of Morya Gosavi which is considered as one of the most famous Ashtavinayak Temples in Maharashtra. The place at present is one of the major industrial hubs in Asia. Some of the other major attraction here are the ISKCON Temple at Ravet, and the Nisargakavi Bahinabai Chaudhary Zoo which is also known as the snake park. Mahabaleshwar in translation from Sanskrit means God of Great Power. The place offers beautiful panoramic views, temples and a pleasant climate which draws nature lovers in large numbers. The hill station was the summer capital of the Bombay Presidency during the British Raj who left their mark here by influencing the architecture of the structures here. Mahabaleshwar is also well known for its strawberry gardens and honey. The Arthur Seat here is considered as the queen of all the view points. One can catch a glimpse of the Savitri Valley on the left and shallow green valley on the right. An interesting factor is that the Arthur Seat is the only place where one clearly distinguish the geographical differences of the Konkan and Deccan plateaus. The Elphinstone Point is a small picturesque spot which overlooks the valleys along with the rivers of Koyna and Savitri, which makes it one of most visited points in the area.